These days, we try to cut costs wherever we can, it should come as no surprise that a lawn mower would be one of those items on which we would try to cut the price as well. Even though we want to save on cost, we do not want to compromise on quality. Whenever quality is compromised, you inevitably end up paying more money than you wished or planned for because you have to fix an error or some other issue. There are certain characteristics that you will find in a lawn mower of quality and certain consideration you need to bear in mind, so that no matter what brand or what price you purchase the mower at, the machine still does the job for you. Consider the size of your yard. This will determine the best type of mower to buy; whether large, small, electric, battery operated or manual. A self-propelled mower is best for medium to large sized yards. Choose a drive system that suits your needs. Some mowers are pushed, walked with little effort invested and others have an electric system that does the job for you. Some lawn mowers have different cutting systems: ejection, collection and mulching. In a situation where you are not sure what type of grass you have and the type of cutting system that is best, get a mower with all three. The amount of effort you want to put in to mow the lawn. This characteristic takes into consideration the power behind the lawn mower. A manual reel mower means you will be doing all the work, whereas an electric mower or a gas operated mower will do more of the work itself, and the effort from you is minimal. Discussed here are three best cheap lawn mowers, that while they are among the cheapest on the market, they do not compromise on quality, and you can be assured of their ability to get the job done. The second on our list and giving our Great States hand reel push lawn mower a run for its money, is the Black & Decker MTE912 12-Inch Electric 3-in-1 Trimmer/Edger and Mower, corded, 6.5-Amp. The specifications on this lawn mower are excellent and it is perfect for anyone not looking for a mower that is not complicated, but will still get the job done. This lawn mower is known for its: automatic feed system which ensures continual work without stopping, gear drive transmission which prevents bogging down, easy conversion wheeled edging, and a 6.5 amp motor which provides maximum performance. The only disadvantage with this mower thus far is that it requires a cord for use, but one is not included with the product, still, once you overcome that hurdle this mower will not let you down. It does exceptionally well, and provides excellent small yard or garden coverage with three types of landscaping options: regular mowing, string trimming and edging. Black & Decker has been known over the years for its household appliances, home improvement products and so much more. They continue this wonderful tradition with this Black & Decker MTE912 12-Inch Electric 3-in-1 Trimmer/Edger and Mower, corded, 6.5-Amp mower, which is sure to give you what you need for the maintenance and care of your yard and get the most out of your money. Starting with the cheapest on our list, this Great states 204-14 14-Inch Deluxe Hand Reel Push Lawn Mower is manual and will require the force of your hand to work well. Its specifications include a 8 ½ inch diameter high impact polymer wheels with integral molded thread, three spider one blade reel, an alloy steel reel and bed knife blade, steel side plates and formed torsion tube, and a cutting height of ½ inch to 1 ½ inch with adjustable three section roller. This mower is not good for tall grass or tough weeds, so in order for it to be as effective as it can be, you will need to stay in top of mowing. At least once a week is recommended depending on how fast your grass grows. This reel push lawn mower cuts the grass evenly, and is easy to start, all you have to do is push! You won’t have to worry about charging batteries, or filling the tank with gas, oil changes or tune ups, so maintenance becomes a breeze as long as you follow the recommendations for care in the manual that comes with the mower. It is perfect for small yards and it would be the best push mower you have ever spent. Other positive points are that it is easily stowed because of its small size, and as with all manual mowers, there will be no issue with noise, so you can mow at any time of the morning or day without worrying about disturbing the neighbours. If you have a small yard and are looking for a hassle free mowing experience then the Great States 204-14 14-Inch Deluxe Hand Reel Push Lawn Mower may be the best cheap lawn mower fit for you. This electric and best cheap lawn mower mower is just what you need to get your chore filled day off to a smooth start. The Sun Joe MJ401E Mow Joe 14-Inch 12 Amp Electric Lawn Mower With Grass Catcher is an electric mower that uses a powerful 12 amp, electric motor to quickly and efficiently mow your lawn. It also has an easy push start button, three position height adjustment up to 2 2/5 inches, a compact design that is easy to manoeuver and takes up less storage space, and a hard top grass catcher which detaches easily for convenient disposal. This mower keeps small lawns immaculately mowed and groomed because of its dependable performance. This is easy to maintain because there are no oil changes, tune ups or gas worries, much like the other two mowers mentioned above. It is purely electric, with a no hassle start up and designed for use with a fourteen gauge extension cord. The blade is steel and durable, and the mower can be adjusted to three different positions manually. This mower is environmentally friendly and so if you wanted to go green the Sun Joe Mow Joe would be a wonderful place to start. Do not let the grass grow too high before mowing, or you will have trouble using this mower. This mower is excellent and perfect for small yards and maintenance, get it today and share the Sun Joe love with your family and friends when they come over for the specific purpose of admiring your lawn. In the recent past, it was the latest trend to go as green as possible in your lives. If you are conscious about how much pollution you put out into the air, you are probably aware that there are ways of getting around constantly polluting the air we breathe by a few different options. One of them that really took off is cordless lawn mowers. These little machines can help you keep a clean and maintained yard, all while keeping you from dirtying the air around you with any more nasty gas fumes. But finding the best cordless lawn mower for you can be a struggle because what exactly do you look for? If they all say that they can give you a cleaner environment, what is it that you really need to know that will set one apart from the rest? Just keep in mind that not every cordless lawn mower is created equal, you need to read up a little before you get yours. Cordless lawn mowers are basically lawn mowers that run on rechargeable batteries and are exactly what they say they are, cordless. This means that they do not have a pull start cord that will activate the motor. Most of them have a one push button that will start the lawn mower with just the press of it. But, one of the only downfalls of having a cordless mower is that often times, the battery does not last a very long time (no more than two hours) so if you have a larger surface area to mow, you may need to take a few breaks. Or instead of using battery-powered ones, you can opt for gas fueled lawn mowers. This could be a negative aspect for a lot of people who do not have a lot of time in the day to do this chore, but that should not outweigh the fact that you own something that is harmless to the environment. So, without further ado, let’s take a look at some of the best cordless lawn mowers out there today. The GreenWorks 25302 Twin Force G-MAX is one of the best cordless lawn mowers from the GreenWorks Company. They specialize in making tools and mowers for you that are sustainable and gas free. This particular mower comes with ion batteries that are easily removable and chargeable when needed. This lawn mower can run for up to 70 minutes on a single charge, so you will not need to worry about it as often. This lightweight lawn mower also has a collection bag that can be used to collect grass clippings, and it has a mulching capability as well. One of the coolest aspects of this cordless mower is that it has a built in technology called, “Innovative Smart Cut” which will adjust the power of the mower and the runtime of the battery all based on the thickness of your grass. This allows for a more efficient running machine and you can spend less battery life. Another great thing with this lawn mower is that it has a switch over feature on the batteries. That means it will use up the power from one and when that is depleted, it will automatically switch over to the other one. If you are in the market for a great, efficient, lightweight cordless mower, this could be the one. Another great cordless mower on the market these days is the Black & Decker MTC220 Cordless 3-in-1 Trimmer/Edger and Mower with 20 volt batteries. This nifty little tool gets you more bang for your buck. Not only does it run on batteries, therefore making it eco friendly, but you get not only a mower, but you get a edger and trimmer for those hard to reach areas and sidewalks. It is easily convertible from each of these three different tools so you never have to struggle going from one thing to another. This lawn mower also comes with two rechargeable ion batteries that should retain their charge up to 5 times longer than other 20 volt batteries of their kind. It also has an adjustable height so you can easily work with it no matter who in your family may be using it. Not only that, but because it is adjustable and it is cordless, the troubles you may had storing three separate other machines are no more. This will easily store anywhere you put it, and without gas or oil, you do not have to worry about leaks. Finally, the WORX WG788 Cordless 3-In-1 Lawn Mower is just another great option for you if you are looking for a cordless lawn mower. This little machine has removable batteries that will recharge and it also features that special IntelliCut technology that gives you just a little more torque for some of those times when your grass may be just a little too thick to cut through. This lawn mower also has a 19 inch blade that is specially designed to cut up and mulch your grass better than any other lawn mower blade. It is especially useful when your lawn is a tad over grown and needs a little extra clean up. The battery in this lawn mower runs for up to 1 hour or 18,500 square feet per charge. So if you have a smaller lawn or you mow fast, you should be able to get the whole thing done before recharging. One of the great things about this particular lawn mower is that the hand can come off which makes it easy for you to store it anywhere in the garage or shed without taking up a lot of space. Now that you have an idea of a few of the best cordless lawn mowers out there today, you have a tough decision to make. While they all provide you with a gasless machine that you can pretty much store anywhere, they all have some differences that make them unique. It’s up to you to find the best one that will accommodate all of your lawn maintenance needs, while making you a happy owner of an eco-friendly, envy inducing, machine. Keeping up with your lawn maintenance is important for the aesthetic of your house, but also the health of the grass in your lawn. It is crucial that you find the right lawn mower for yourself that way you are able to get the perfect cut on your grass and you do not have any problems with the mower itself or any problems using the lawn mower. So what are the best rated lawn mowers out there today, and how can you find the right one for you? It can sometimes be overwhelming if you are shopping for a lawn mower for the first time and you have no idea what exactly it is that you want. Researching the best models out there now is always the first place to go, and when you do start looking, you want to start looking at the best. Let’s take a look at three different mowers, best rated lawn mowers around, all for a reasonable price for your wallet. They vary in size due to different wheel heights, so if you want something small, you should be able to find the one that will work for you. One of the biggest differences is that one of these lawn mowers is electric and good for the environment. If you live a “green” lifestyle, you will soon find out that your lawn does not need to suffer with a gas powered machine. There really is a lawn mower for everyone out there. 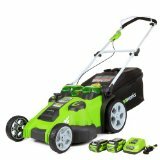 Lastly, let’s take a look at the GreenWorks 25022 12 Amp Corded 20-Inch Lawn Mower. With durable steel blades that have a 20 inch cutting width and a choice of seven different cutting heights, this little lawn mower makes your lawn maintenance chore even easier. It has higher rear wheels that will allow for you to navigate your tougher lawn terrains or even the hilly areas. One of the best things about this lawn mower is the fact that it does not run on gasoline. This is a “green” product, therefore it is electric. It comes with its own power cord for you to recharge it after it has been used. This is great for if you live in an area that has harsh winters because you will not need to worry about keeping the machine maintained or about any gas leakages over the colder winter months. It’s easy to assemble and it’s easy to push around your lawn when you want to use it. An added bonus to using an electric lawn mower over a gas powered one is that it is quiet and hardly has some of that rumble you get from other machines. Another lawn mower that is highly ranked is the Lawn-Boy 17732 Carb Compliant Kohler Rear Wheel Drive Self Propelled Gas Walk behind Mower. This lawn mower is a self propelled mower, meaning that it doesn’t take as much force from the person pushing the mower to get it going. This is great for teen boys starting out their own lawn mowing business, or just for someone who perhaps doesn’t want a mower that is too heavy to push. Not only that, but it is made out of a lighter weight steel that allows for durability without being overly bulky and heavy. While this mower only has two different heights to cut your grass, it doesn’t mean that it will not get the job done properly every time. You can also mulch, collect, or discharge your grass with the Lawn-Boy, and if you choose to collect it, this lawn mower comes with a rather large attachment bag to collect everything you cut. With an easy pull start, it can easily get going again if for some reason it gets a little overwhelmed with the amount of grass it is cutting. But do not worry, it starts itself back up right away and you can continue on your merry way. Plus, with this wallet friendly price, you get the best rated lawn mower that may not have a lot of frills, but it will surely get the job done when you want it to. Take a look at the Husqvarna 7021P 21-Inch 160cc Honda GCV160 Gas Powered 3-N-1 Push Lawn Mower, you have a highly efficient machine that boasts a compact design for easy storage and high wheels that makes it easy to maneuver in tight spaces around your garden, deck, house, or sidewalk. This lawn mower has a 21 inch cutting width, allowing for more coverage when mowing your lawn. Plus, with six different height positions for the blades from 1.5″ to 3.5″, you can easily choose how high or how low you want the grass to be cut. The great thing about the 7021P model is that you get a choice in three different cutting modes for your lawn; you can collect it, mulch it, or discharge it out the side of the mower. Giving you so many options for your grass is what makes this lawn mower one of the highest rated. Another wonderful aspect of this lawn mower is the fact that it comes with a foldable handle. This is just another thing that makes storing this one, a breeze. When you start comparing the top rated lawn mowers on the market today, you see that they all offer some similar things, and they have some special features that maybe other lawn mowers do not provide. It is all a matter of what you prefer, whether it is gas powered or electric, self propelled or a push, easy to store or wider cutting range. They really have it all. The great thing about these three best rated lawn mowers is that you can get a quality product for your lawn for a price that will not break the bank. And with a lawn mower, it is something you can have for years before replacing again. Just do your research, make a list of what it is that you will want, and go to the stored armed with the knowledge you need to make the best decision for you and your lawn.